“Often riveting, by turns heartbreaking or funny, splashy or haunting." 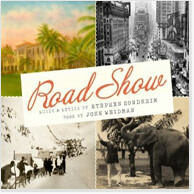 Stephen Sondheim and John Weidman's new musical, inspired by the entrepreneurial exploits of brothers Wilson and Addison Mizner, featuring Michael Cerveris (Wilson Mizner), Alexander Gemignani (Addison Mizner), Claybourne Elder (Hollis Bessemer), Alma Cuervo (Mama Mizner) and William Parry (Papa Mizner). Spanning 40 years, from the Alaskan Gold Rush to the Florida real estate boom of the 1920s, it's the story of two brothers whose quest for the American dream turns into a test of morality and judgment that changes their lives in unexpected ways. As The New York Times noted of the show formerly known as Bounce, this is a "trimmed-down, toughened-up and seriously darkened new edition," in which "the great living master of the American musical has returned to the shadows where, artistically at least, he has always felt most at home," creating in the process "a timely metaphor for an economic boom gone bust."